Last time, we noticed the overwhelming number of biblical examples that support the essential nature of baptism. Next, we will consider the possibility of exceptions. From this passage, we learn many lessons, but none more significant than the words that have been underlined. Even if the thief on the cross had not been baptized, two striking realities must be acknowledged. 1. Prior to His death, Jesus exercised authority to save whoever He wished. Even though the perfect sacrificial offering had not yet been completed, He is the Creator and has the right to make exceptions. Much like the Old Law sacrifices, the thief's sins were covered in eventuality by the ultimate death of the Lamb of God. 2. Before Jesus ascended, a month and a half later, He promised that the Holy Spirit would come and inspire them with a new testament church age instruction. The foundation of these inspired directives came in Acts 2 and is intended to govern the salvation process throughout our age. Q: Will Jesus make exceptions today? What if a person makes a deathbed confession? What if a person dies on the way to his baptism? What if...? A: He is God! Why would anyone attempt to limit God? Why would anyone second-guess His potential? He is a God with immense love and mercy for His creation. But that's not really the question we need to be asking! Q: The real question is this: "Is it our place to preach and teach those possible exceptions and, thereby, distract followers from God's clear commands?" A: Absolutely not! Even if you discount all the evidence that the thief very probably was baptized by John or Jesus (see the previous chapter), it still does not make it our right to preach the anomaly. "Loophole" evangelism is the most arrogant form of hermeneutics (human rules for interpreting Scripture). It removes the exception from God's control and turns the exception into the rule. 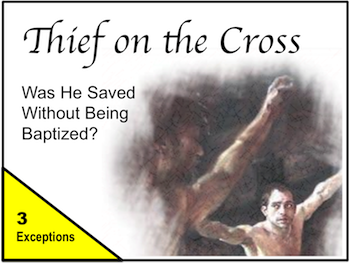 The answer of this important question, "But what about the thief on the cross?" will anchor itself to three biblical principles: Examples, Exceptions, and Excuses. Next time, we will look at excuses and the damnable results of human resistance to the obvious commands of God. Please join us then! The Thief on the Cross: "Excuses"